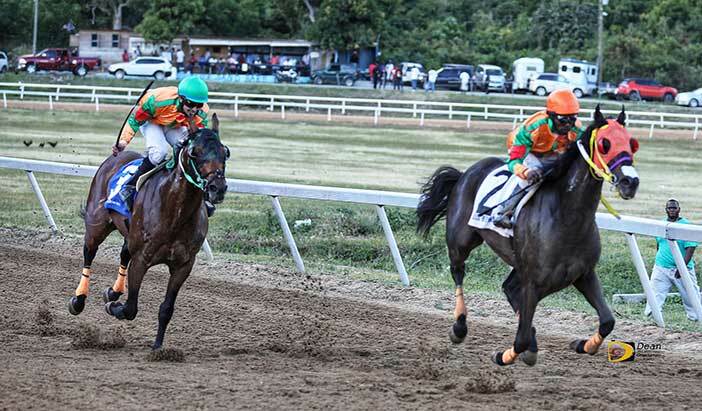 Moonlight Bandit held off fast charging stable mate Giant Valley, to win Sunday’s $8,000 feature race for Class A and B Horses at the Ellis Thomas Downs, helping Tortola horses to a third straight victory after St. Thomas horses won the first two races. Jockey David Rosario, seeking his third straight One Mile triumph, put Giant Valley out front with St. Thomas’ Go Pancho Go, making David Hurst change his strategy on Moonlight Bandit. But, Moonlight Bandit took control of the race on the back stretch, then held off the charging Giant Valley, as the horses from Top Priority Stables finished 1-2, with Moonlight Bandit cutting the tape in one minute 50.4. Go Pancho Go was third followed by Unknown. Rosairo guided Lunch Break to victory over St. Thomas debutant Crypto Hold preceding the feature race over One Mile, race for Class B horses and $6,100. He won in 1:48.3. DQ Rester finished ahead of Flashing Cat, who gave handers trouble entering the gate and delaying its start. Rosairo’s other victory came in race three, when Nadiaes Image held off My Song Venezuela of St. Thomas, to win the One Mile $6,100 race for Class C horses, in 1:49.2. Queen Grave was third ahead of Atra By Me. Haylee’s Here won the first One Mile race for Class C horses in the $5,500 race, after laying off the early pace. Guided by jockey Jose Hernandez, the St. Thomas horse dropped a time of 1:48.3 on the field. St. Thomas’ Irish Smarty running from the outside corridor, was second, with Sailer’s Companion, the only Tortola horse in the field, preventing a St. Thomas sweep in third place. Debutant My Running Mate finished ahead of Jordan’s Salsa. The card opened with Jockey Kenneth Pallot leading St. Thomas’ Gus Is Tuff to a sweep of the 7 Furlongs race for Class D Horses, which had a $5000 purse, in 1:35.3. Lil Fool followed then debutant Jack Fallon, with Uncle Mace finishing fourth. The next race day is set for February 17.